As you can see, I have a really small closet me and my fiance’ actullay share a closet, so I like to keep my side as organized as possible. I have a lot of clothes and accessories, so I love coming up with new ways to organize and makes things more accessible and easy to find! 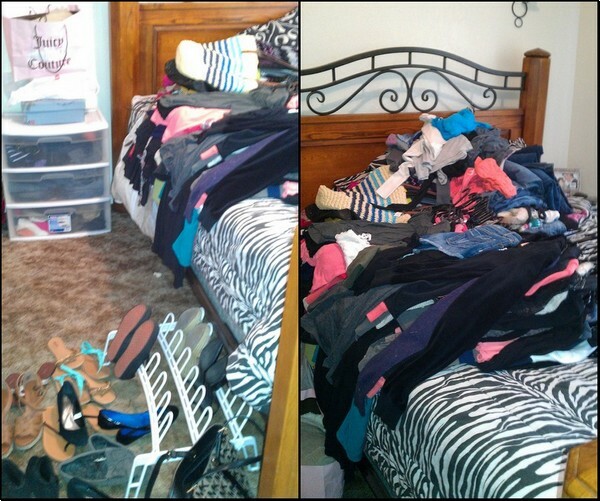 When my closet starts looking messy like it was in my before image, I know it’s time to clean and get organized. I have a few steps I like to take to achieve what you see in my after picture! I will list those steps below along with pictures! 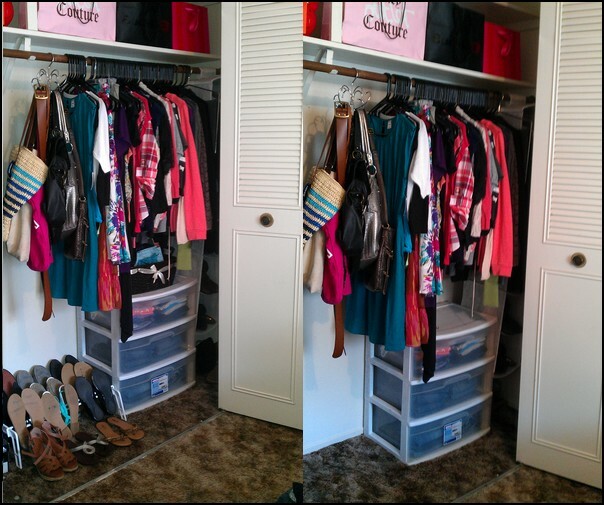 The first step I like to do, is to completly clear everything out of your closet, you will be able to see what you have to work with, and like I did I moved some things in different stops to make it look more neat! Clearing everything out will also allow you to see everything you have, things you may have forgotton you have, things maybe you know you wont where anymore and so on. I like to set everything aside and while im orgazining it gives you a change to go through everything you have. Now that you have everything moved out, it can just look like a big mess (which it is), this is what is going to help you see what you have and to better make since of everything, and how you want to organize it! 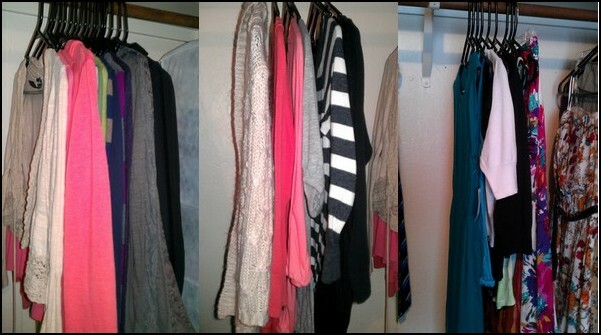 Personally I like to organize by season, and then color, so we are coming into summer, so I like to put my dresses, tanks and so on in front, and put longer sleeves and jackets either away or towards the back of the closet, and then from there I like to organize those sections by color! 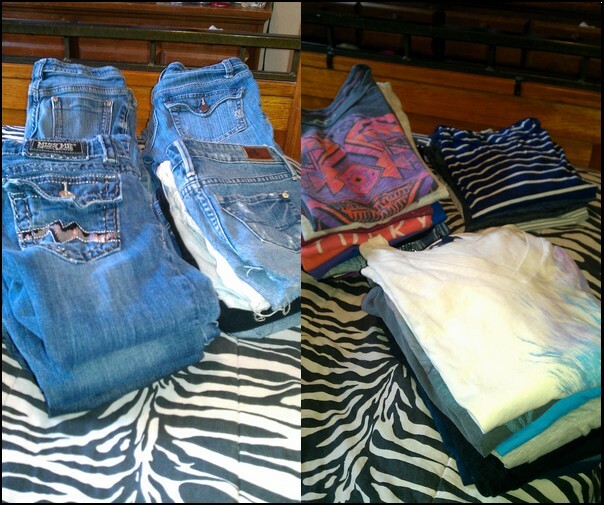 If you just wear whatever, organize maybe by what you where most often! I personally would like to hang up all my jeans, unfornantly my closet is just not big enough, so I bought a white sterlite 3 drawer to put my graphic or plain shirts, in the top drawer, and jeans, capris, and shorts in the other drawers to still keep them organized! 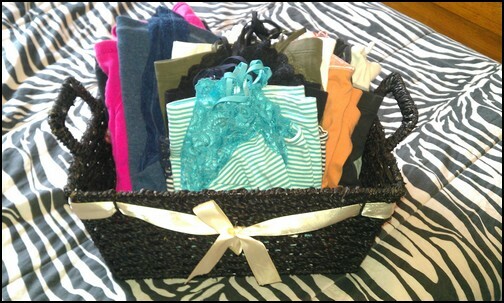 I love resuing my shopping bags, and cute baskets. I had an empty space on top of my 3 drawer that hold my shirts, and jeans, So I decided to take a cute basket that wasn’t really being used and I put all my camis, and undershirts in there, and it added a super cute touch. I have 2 large shelves above where my clothes hang, so I took my bigger shopping bags, and used those to store my scaves, and other smaller items! I recently bought a cute heart hanger, to hang multiple things on, such as my belts, and purses, these come in handy since they are kind of hard to store without looking messy, so I thought this was really cute to put right in front! 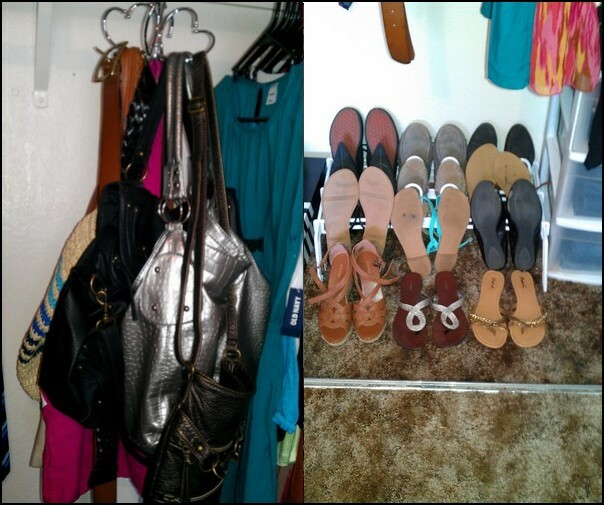 My shoes were not to hard, I just had a white show holder, so I put most of them in there, and at the very back of my closet I have a white cloth hangy 6 drawer, where I keep other flats, and some of my smaller boots, and also the first 2 sections I have all my nicer tank tops. Well I had fun cleaning my closet and going through everything, I hope this helped some of you, I loved the way it turned out! I hope this post was not to long and boring, but I hoped helped or gave you some ideas for storage! 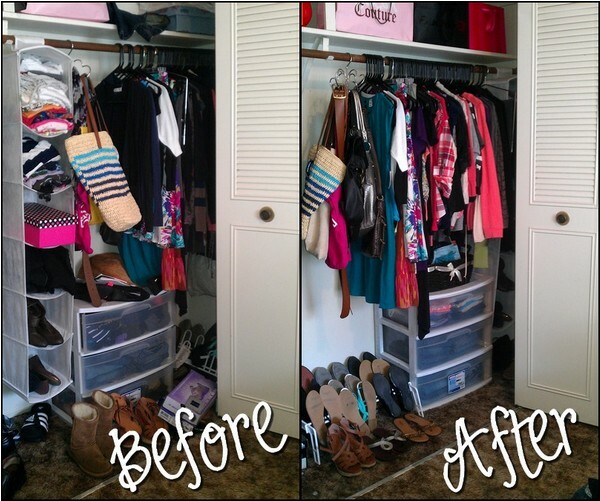 Good write up Organizing a small closet anything an everything. I’ve not thought of this kind before. It can be a wonder what you might learn online.